Use the Cruise Finder tool below to check all major cruise operators for the latest itineraries. Create your own adventure. Discover exclusive travel bargains on cruises to the Caribbean, Alaska, Mexico and Europe. Departure Ports include New York, Miami, Los Angeles, New Orleans, and Jacksonville, Florida. Popular Destinations include Bahamas, Mexico, Hawaii, Alaska, Bermuda and the Mediterranean Sea. Cruise Lines include Carnival, Celebrity, Holland America, Costa, Royan Caribbean and Princess. Group Cruises are available to all destinations for corporate events, clubs, family and school reunions. Carnival – Sail with Carnival and find out why their fleet is just more “Fun”! Celebrity – Be treated “famously” on board a Celebrity ship. Costa – Experience the joys of cruising “Italian Style”. Crystal – Exemplary service, exotic itineraries. Cunard – Savor the delights of the most famous ocean liners in the world. Disney – Magical moments await for the young & young at heart. Holland America – Come experience a “Tradition of Excellence” with Holland America. Norwegian – No rules, no limits. See what NCL “freestyle” is all about. Princess – “Escape completely” and sail with Princess. 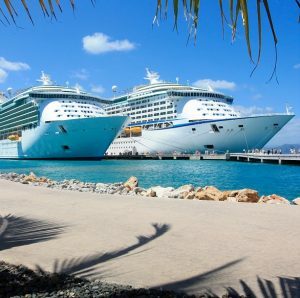 Royal Caribbean – “Get out there” for some excitement! Windstar – Cruise off the beaten path on a vacation that’s 180 degrees from ordinary.